Featured Designer: Sherman | Oh, for the Love of Vintage! I thought it very fitting to do a post today about the wonderful costume jewellery designer, Sherman. Why is that fitting you ask? Today is Canada Day and Sherman is Canada’s most renowned costume jewellery designer! It’s also been a while since I’ve written a post about a jewellery designer. Do be sure to check out my previous post on Miriam Haskell. Gustave Sherman, a former jewellery salesman, set up his first factory in 1947 in Montreal, Canada. (Since I’m here in Montreal, I actually thought about trying to track down the factory location – but I haven’t had the time!) Sherman used his knowledge of the jewellery industry, design and techniques to create an amazing signature collection. Sherman costume jewellery was created from 1947 until the early 80s when the factory closed. During that time, his pieces were very popular and widely available at department stores. 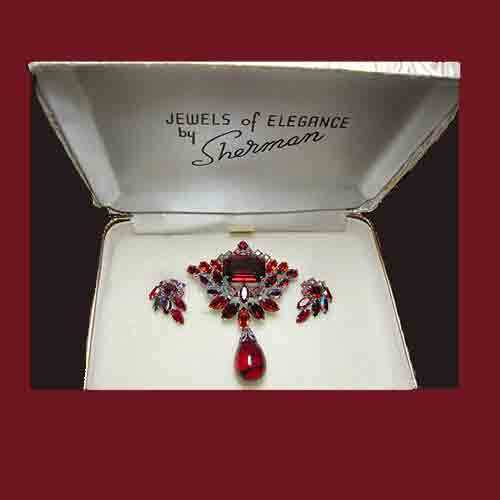 Many costume jewellery designers utilized rhinestones and cyrstals, but Sherman’s were unique. 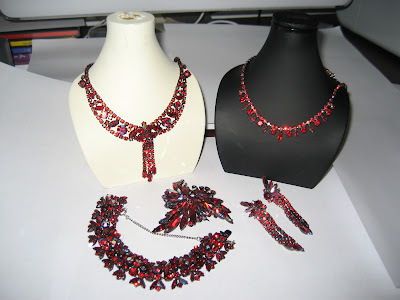 Sherman pieces were only created using top quality Swarovski rhinestones and cystals. 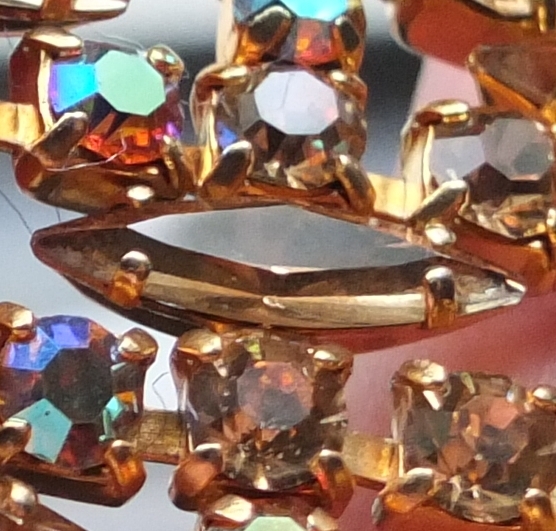 You notice this straight off when you look at a Sherman piece, as the sparkling, multi-faceted stones really stand out. They sparkle so much they practically light up a room! Sherman produced a variety of pieces including necklaces, bracelets, brooches and earrings in a variety of colours. Pieces that are commonly found are necklaces, earrings and brooches. Sherman bracelets, on the other hand, are hard to find and much sought after. Sherman jewellery comes in a variety of colours including clear, blue, purple, black , yellow, fuschia and red. The most common colours are clear or blue. A rare colour, which is highly collectible, is Siam red. A signature of Sherman’s work is the use of navette (or marquise) cut stones. Navette/marquise cut stones are identified by the oval or ‘boat’ shape. They are a multi-faceted oval stone that has a point at each end and a flattened top. Another identifier of Sherman’s work is that the stones were always prong set and not glued. Meaning that the stones were set and then the metal prongs were bent over top of the stones. I thought I had several Sherman pieces in my collection. However, when I had a closer look I discovered that pieces I assumed were Sherman were actually Weiss, Austria, Boyd Bond, etc. No matter, I still found a few gems to show you! Find below a lovely 50s bracelet I’m sure is Sherman, however it is unsigned. The beautiful amber navette rhinestones just sparkle! As an aside, there’s an ongoing debate as to whether any Sherman pieces were sold unsigned. It appears that when a set of earrings, bracelet and necklace were sold that perhaps only one piece in the set was signed. 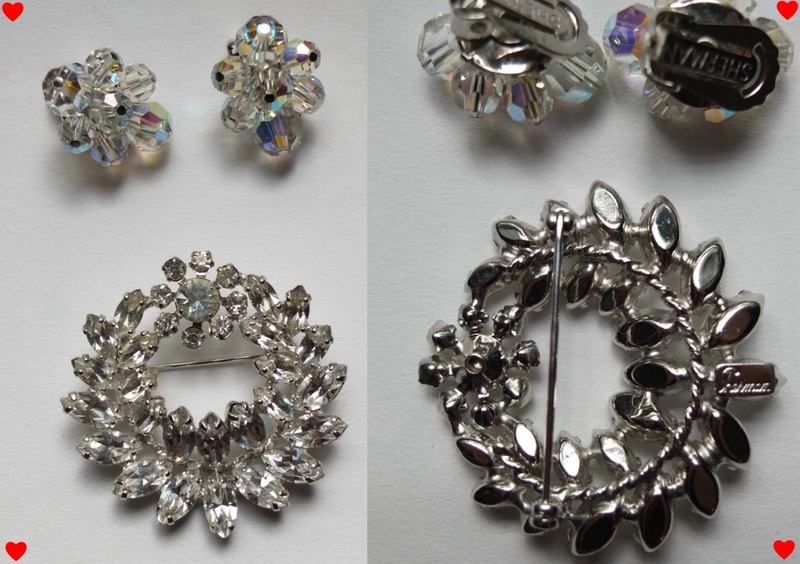 Below you’ll find a lovely example of a Sheman rhinestone brooch and bead clip on earrings. I’ve included a photo of the back, so you can see what Sherman hallmarks looked like. It is useful to note that if the name appears inside of an oval shape, the piece is from the 1950s. If the name appears inside of a square shape, the piece is from the 1960s. The below brooch is then probably from the early 1960s. 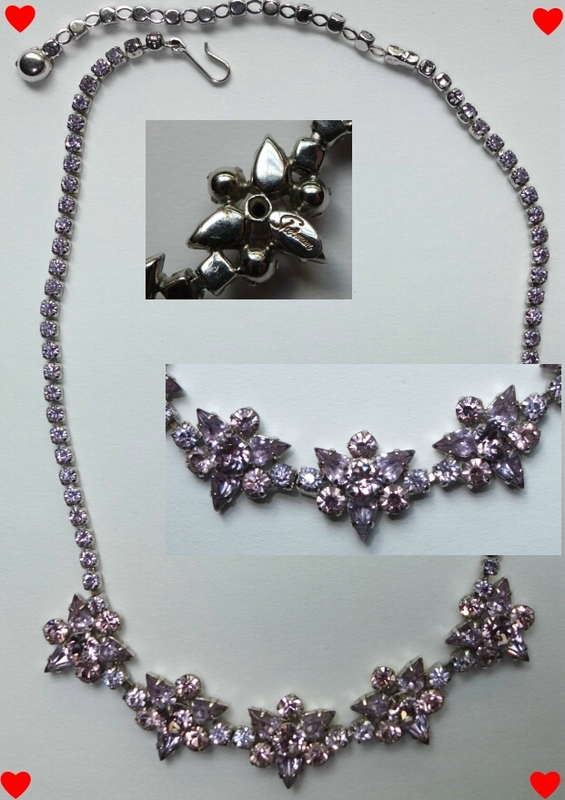 Here is a lovely example of a Sherman 1950s rhinestone necklace. I bought this at a flea market last year for $1! I was thrilled and amazed at how sparkly it still is. It looks practically like new! In the photo of the back, you can see the Sherman hallmark in an oval shape, denoting the 1950s. Let’s have a look at more Sherman! Sherman jewellery is highly collectible, especially the rarer pieces and colours. If you’re lucky you can find inexpensive pieces at flea markets or yard sales. If you purchase Sherman jewellery online you’ll probably pay within the hundreds if not thousands. However, Sherman brooches are more common and you can purchase those online anywhere from $30-60 depending. Sherman Resource Page – a great place to look at the variety of styles and colours of Sherman jewellery! 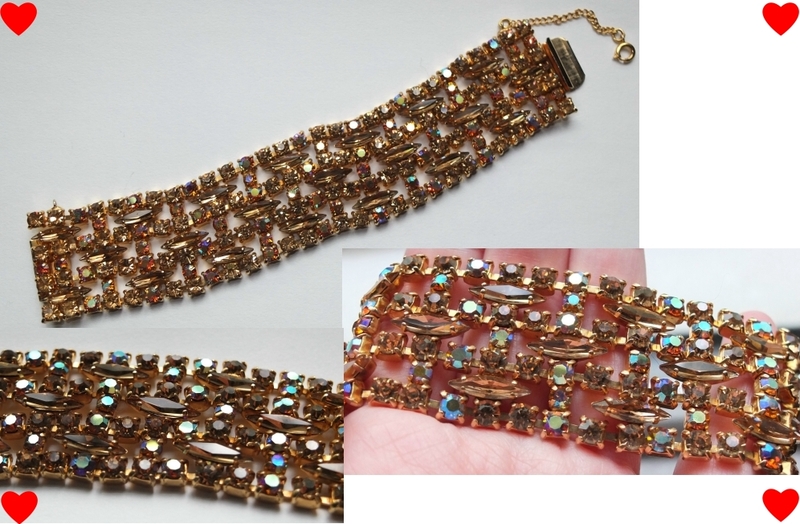 Sherman Vintage Jewellery – wonderful blog dedicated to Sherman jewellery. Do you have any Sherman pieces? While I don’t have Sherman pieces in my collection, but I can certainly daydream about them! My word, these are some sublimely beautiful creations. They’re opulent and eye-catching for sure, yet they don’t strike me as being hard to wear, even on a somewhat more day-to-day basis, which, IMO, is often the hallmark of a truly excellent jewelry designer. Wishing you a gorgeous, sun-kissed July! You’re so right! Sherman pieces are easy to wear and depending on the colour can go along with just about any outfit! Hope you had a fabulous Canada Day! Wow, that was fascinating! I’m not sure I’ve heard of Sherman before, but I’ll definitely be on the look out. That necklace you got for a dollar is GORGEOUS. I love finds like that. I’m pretty sure I’ve heard of Sherman before but it’s very interesting to learn more about his exquisite work, thank you so much for posting. You can tell just by the photos that the pieces are high quality and I especially like the Black/White contrast brooch. It’s incredible that you found one for $1! I have bought whatever I can for my sister from Ebay, but hard to find great pieces. If I lived in Montreal I would be looking for his wife who is still alive from what I have read and trying to get pictures and info as there is not much more than speculation about Gustave, the man himself. Very nice blog you have, and great tips. I agree. I think the most spectacular Sherman pieces would most likely be hiding in private collections in Montreal where Sherman originated. In the 80’s you could come across amazing pieces and get them for very little. Now everyone knows the value of Sherman jewellery. There are still good finds on e-bay, however with the Canadian exchange rate you have to look for low reserves on the piece. Can’t believe that we pay US dollar for Canadian jewellery! I have been buying Sherman at yard sales and church sales for several years. I was thrilled today to find a pair of blue earrings to match the brooch I bought several years ago. The set cost me a whole $1.25! Do you still have it for sale ? Earrings and bracelet it says or just earrings. Your $1 find necklace is even more valuable than you think. From what I can tell the stone is a changing color depending on lighting, alexandrite. Very rare and sought after. Good work ! Hi. I have a cuff bracelet that is gorgeous and unsigned. It came with other sherman pieces. I can’t seem to find a likeness on the Internet. Could I send a photo? I just found a pair of the earrings that u show in one of the pictureswould love to learn more about them ..
« Oh, for the Love of…Niagara!